KANSAS! is a four-color magazine published by Kansas Tourism, under the Kansas Department of Wildlife, Parks & Tourism. The publication promotes tourism in the state with an emphasis on travel articles. KANSAS! is published quarterly with spring, summer, fall and winter issues. Seasonal material and photographs are featured in each issue. KANSAS! is offered by paid subscription to a list of about 35,000 and found on newsstands at local grocers and bookstores. Nearly 70 percent of subscribers lives in Kansas and they fall within the 50-plus-age bracket. They are interested in the magazine's scenic photography as well as a variety of tourism related articles. The publication continues to seek the attention of younger readers and families, expanding to a wider demographic. Each issue of KANSAS! magazine contains various department stories and four to five features, based on the season and the editorial theme, and a seasonal photo gallery feature. 1. The story must have the potential for interesting photography. The magazine prides itself on its photographic representations of the state, thus, we are only interested in stories with the potential for interesting photographic possibilities. 2. All subjects must be Kansas-related and must reflect the state positively. 3. All articles are, with very few exceptions, nonfiction. Poetry, fiction, humorous and nostalgic stories are not used in the magazine. 4. Because the magazine is intended to promote tourism in Kansas, all articles must feature events and attractions that are open to the public. For instance, the magazine does not feature a private home unless it is open to tour. 5. Events included in the magazine must be annual events so that they can be covered one year and featured the following year. 6. Please research back issues of the magazine at your local library to make sure your proposed article has not already been featured in a previous issue. 7. The magazine works at least one year in advance on articles. Articles submitted and accepted in June of one year will most likely appear in the summer issue the following year. The actual working deadline is about three months prior to an issue. 8. Do not send unsolicited manuscripts. Please briefly outline the proposed article in your query letter indicating projected sources. Include your ideas for color photography and indicate whether you plan to submit your own transparencies to accompany the article or have made arrangements with a photographer to work with you. If you cannot arrange for photography, simply state that in your query. But please do specify your ideas for photographic content. 9. Note seasonal issues and issue themes that have included: outdoors, arts, food and people. Please adhere to the following guidelines in preparing and sending your article and slides. 1. Articles should be about 400 to 800 words, but the editor will give you a word count when you are assigned the story. If possible, please submit the article on disk in Microsoft Word format. 2. The article should have a suggested title and subhead. 3. To make sure the article is of interest to our readers, it should include quotes from at least one source and some background material on the subject. 4. All articles must be accompanied by the name, address and phone number of an appropriate contact person for the article. 5. Please allow several weeks for a response from the editor. 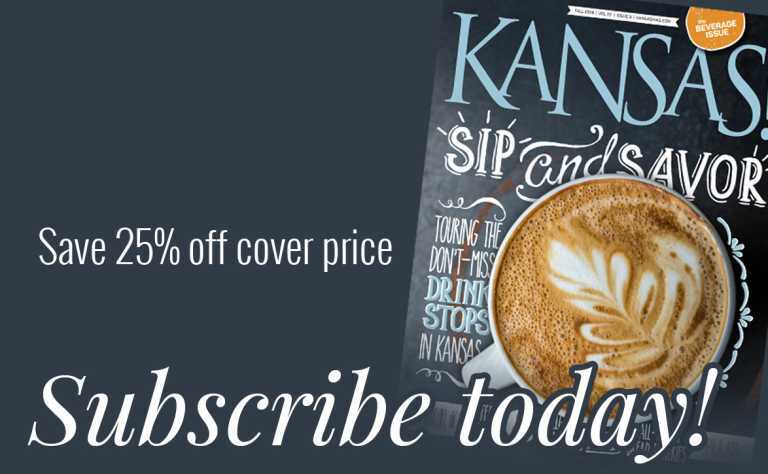 Each issue also contains regular departments offering other opportunities for contribution including Reasons We Love Kansas, Tour Kansas and Tastes of Kansas. The magazine purchases both articles and photographs on a one-time-use basis and an extended-use basis with First North American Rights. Payment arrangements for articles and photographs are made upon acceptance. The editor will make a payment offer when the article is accepted. You will be sent complimentary copies of the issue that features your work. Please keep in mind a few things as you consider preparing material for KANSAS! magazine. Query letters are important. They save you the trouble of preparing an article that does not meet the magazine's current needs. They also give the editor an idea of your writing style. Telephone queries and drop-in visits are not acceptable. We would prefer all correspondence regarding articles and photographs be handled by e-mail, but will accept mail. We welcome the opportunity to work with you. Please email us at ksmagazine@sunflowerpub.com if you have any further questions about these guidelines. Getting your Photographs in KANSAS!? Photographs are the highlight of KANSAS! magazine. Stories are assigned in part, for their potential for colorful photography. We use photographs to illustrate all articles and also use scenic photographs reflecting the season in the gallery. There are two ways in which a photographer may work with KANSAS! The magazine accepts scenic, seasonal photographs. Once you are established with the magazine, having had several scenic photographs featured, you will be eligible for photography assignments. Arrangements for photography assignments are made individually- deadlines, payment etc. will be discussed at the time of the assignment. KANSAS! magazine features outstanding photographs of subjects (primarily landscapes or Kansas-esque scenes) in all parts of the state. These are submitted by freelance photographers. We look for photographs of interesting or unusual Kansas scenery to project a positive image of the state. We use horizontal and vertical formats and like to see submissions that reflect a variety of both. • Complete photographer contact information must be noted in a separate word document that accompanies the CD. If you wish to submit scenic photographs for consideration or for the magazine or calendar (see calendar information below), please send a CD. All images should be marked with your name and address and the location of the subject of the photograph. We cannot be responsible for unmarked images. After we have made our selection of scenic photographs to be used, which generally takes two months, we will contact all accepted photographers and make arrangements for contract and payment. Photographers will have their work held until the magazine is delivered to the printer. If your work is featured in the magazine, you will be mailed copies of the magazine for your use. KANSAS! magazine publishes an annual calendar which features horizontal color images. The calendar is mailed to subscribers and sold at bookstores across the state. It is printed in conjunction with the fall issue but selections are made in May and June. Generally, landscapes representing a variety of regions of the state are selected for the calendar. Photographers are notified of selections by July 1. Photographers with work featured in the calendar will be mailed six copies of the calendar once printed. The magazine purchases both articles and photographs on a one-time and extended-use under First North American Rights. KANSAS! magazine will make payment after work is selected. If your work is selected for use in the magazine, the editor will make a payment offer based on the agreed upon use contract.